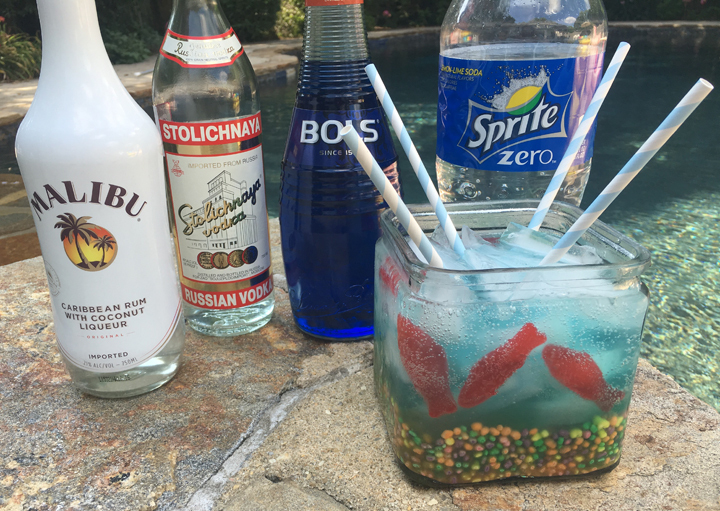 Here’s our take on the whimsical Fishbowl Punch. Dive in to a bowl sized version and share with friends or cut the recipe in half or quarters to dip your toe in the tropical waters! Enjoy! Pour Rum, Vodka, Curacao and Juices and 4 ounces of Sprite into a pitcher and stir. 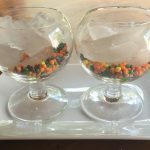 Put Nerds in the bottom of a glass bowl or large container or for an individual size, try a brandy snifter. Pack the rest of the container with ice. Place Swedish Fish (or other gummies) along the sides of your container; held in place with ice. 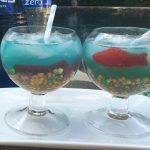 As soon as the liquid hits the Nerds, they will start to melt and discolor your drink so don’t pour until you are ready to drink. When you’re ready, pour the mixture over ice and top off with more sprite. Add four straws and four friends and have fun! 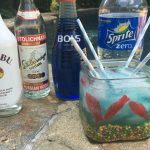 This Fishbowl Punch is an adaptation of a Blue Hawaiian – if you like the drink, but not the murky water, try it without the Nerds for a cleaner look and taste. Fun to share with a crowd! It’s that time of year again – Cookie Season is here! 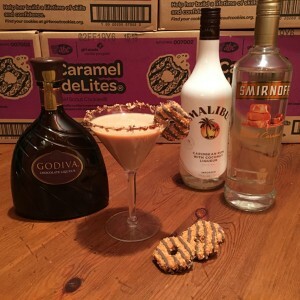 Toast to the women of Girl Scouts as you sip this deLiteful caramel, coconut and chocolate creation. 1 Samoa or Caramel deLites Girl Scout Cookie – you only need one per cocktail but support Girl Scouts and buy a few boxes! Heat an oven to 350 degrees. Place the coconut on a foil or parchment covered cookie sheet and toast in the oven until the coconut is golden brown, approximately 5 minutes. Pour the Chocolate Syrup on to a small plate. Pour the toasted coconut onto another small plate. Dredge the rim of a martini glass in the chocolate syrup. Dredge the chocolate coated rim through the toasted coconut. Fill a cocktail shaker with ice. Pour Caramel Vodka, Godiva Chocolate Liqueur and Coconut Rum over ice. Shake well and strain as you pour into your chocolate and coconut rimmed glass. With a sharp knife, carefully cut a slice into your Samoa cookie, and then a second slice to create a very, very small wedge in the cookie. Garnish your cocktail by using the wedge to hang the cookie on the side of the glass. Enjoy!